On Saturday, hundreds of CWAers rallied at the AT&T building in downtown Detroit to send a message to the telecom giant: No jobs, no deal. CWA President Chris Shelton, CWA District 4 Vice President Linda L. Hinton, Rep. Debbie Dingell (D-Mich.), and Michigan gubernatorial candidate Gretchen Whitmer joined workers and allies at the rally to call on AT&T to negotiate a fair contract that keeps good, family-supporting jobs in their communities. "AT&T, are you listening? You're not getting a deal in District 4 unless it comes along with jobs," President Shelton said. "When the tax deal was being proposed, AT&T CEO Randall Stephenson was out every single day, every place he could be, saying that for every billion dollars that AT&T saved in tax money, they would hire 7,000 people. What he didn't say was that they were going to hire them in Mexico, the Dominican Republic, Philippines, and India, because that's the only place where they're hiring anybody. We cannot get a deal unless they live up to their promises and bring jobs back to the Midwest." Before the Tax Cuts and Jobs Act passed, AT&T promised that corporations would use their massive windfall from the bill to raise wages and create thousands of good jobs. Instead, just days after the tax bill became law, the company announced that it was closing its Detroit call center, leaving more than 100 workers – each with over 15 years of service at the company – without a job. Former AT&T call center worker for 25 years and CWA Local 4004 President Merle Milton of Detroit called out the company for recent layoffs in Michigan and across the country. "Last year AT&T laid off thousands of people including right here in Detroit. These jobs are important for Detroit and we can't afford to lose them. We're organized and we're going to fight back. We're ready to do whatever it takes. No jobs, no deal," Milton said. Midwest workers and communities have been particularly hard hit by call center closures and layoffs as AT&T shifts jobs to overseas contractors, with more than 2,300 layoffs in the past three years alone. Nationally, jobs numbers at AT&T are down 29,000 from two years ago. CWA members covered by the Midwest and Legacy T contracts have voted to authorize a strike if the company refuses to invest in U.S. workers and jobs. Hundreds of CWAers rallied at the AT&T building in downtown Detroit to send a message to the telecom giant: No jobs, no deal. AT&T should make no mistake – CWA members will not be fooled by this outrageous attempt to divide us. "No Jobs, No Deal" isn't just a slogan. It is a commitment that we have made to one another to stand together and fight against AT&T's relentless outsourcing of our jobs in pursuit of more and more astronomical profits. We have made progress over the past few weeks on many issues, and our bargaining teams are committed to negotiating fair contracts at AT&T Midwest and AT&T Legacy T.
CWA has filed Unfair Labor Practice (ULP) charges against AT&T for this attempt to circumvent the collective bargaining process. Learn more and sign the petition tell AT&T CEO Randall Stephenson that you support good jobs and a fair contract at GoodJobsATT.org. Newsroom employees of The Southern Illinoisan voted unanimously to join the United Media Guild/NewsGuild-CWA Local 36047. "I'm excited to take the next step in our newsroom, earning a bigger voice at The Southern Illinoisan," said Todd Hefferman, a sports reporter at the newspaper. "Today is a big win for local journalism." The Southern Illinoisan joins the St. Louis Post-Dispatch, the Casper (Wyoming) Star-Tribune and Missoula (Montana) Independent as Lee Enterprises-owned newspapers with a union voice at work. With the looming threat of a decision in the Janus v. AFSCME case that would reduce workers' power to join together in strong unions to speak up for themselves, their families, and their communities, CWA Local 1180 is working to meet attacks on public sector unions head-on and make sure that the local stays strong and unified. The local represents 8,500 New York City workers and 6,200 retirees, and is one of CWA's largest public sector locals. 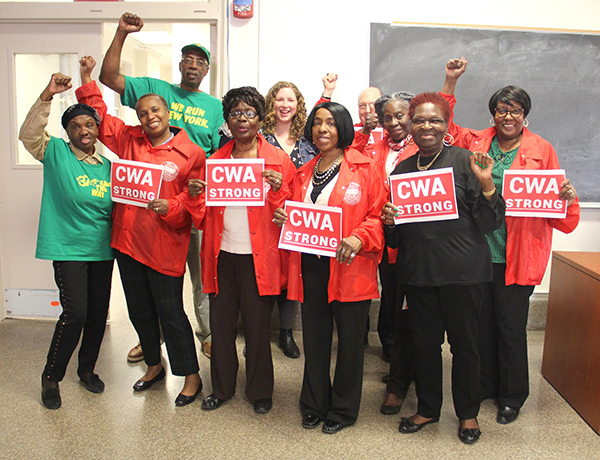 As part of the CWA STRONG program, Local 1180 has enlisted the help of retiree members in strengthening its organizing work. The "Retiree Membership Brigade," or RMB program, was launched in February with a goal of signing up agency fee payers as well as building one-on-one relationships with members. Inspired by a similar program run by AFSCME DC37, CWA Local 1180 recruited eight retirees to go out to worksites two to three times per week to talk to members and agency fee payers about why the union is important, as well as survey the membership on their views of the union and on what the union should be working. "The conversations are interesting. People have been receptive. They say things like, 'Just let them try to take our union,'" said Claudine Murphy, a Local 1180 retiree. "We discuss different scenarios from Right-to-Work states and people ask, 'Could that really happen here?' We say yes, it will – and we need to fight back. People realize how important the union is." In just four months, RMBs have signed up 389 workers as full dues-paying CWA members, collected 581 surveys from members, and collected $245 in weekly contributions to CWA's Political Action Fund to build political power for workers. 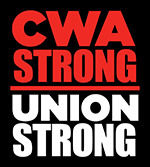 CWA Local 1180 is working to meet attacks on public sector unions head-on and make CWA STRONG. At this week's Demos awards ceremony, CWA President Chris Shelton urged progressives to fight back against efforts to destroy the labor movement. 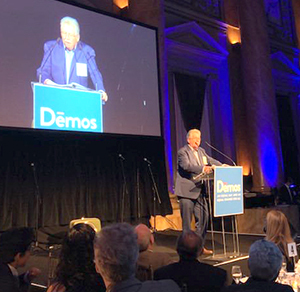 In remarks at this week's Demos "Transforming America" awards ceremony, CWA President Chris Shelton urged progressives to fight back against big corporations' efforts to destroy the labor movement. "Democracy cannot survive without a vibrant labor movement," Shelton said. "It is no accident that for the last 40 years, the Koch Brothers, and the so-called "Right-to-Work" Committee, and the Chamber of Commerce, and their puppets, like Scott Walker and Chris Christie and Samuel Alito and Neil Gorsuch, have been laser-focused on wiping out the labor movement. When workers have no voice on the job, and they have no organized voice in society, only the voice of the corporate elite can be heard." "Progressives of every stripe must do everything in their power to ensure that labor organizations are not wiped out by the corporate Republican machine. We must fight to change the laws in this country so that the labor movement can grow once again," Shelton said. Demos is a prominent public policy organization that works to ensure that we all have an equal say in our democracy and an equal chance in our economy. The group honored President Shelton noting, "From raising wages or defending human rights, flushing big money out of our political system or ensuring sustainable jobs, he has fought to improve the lives of workers." It's a challenging time to work in customer service. Customer service representatives are facing the threat of big corporations offshoring and outsourcing jobs, pressure from monitoring and metrics, and much more. To address these issues, CWA's Political Department and Customer Service Department partnered to train 23 CWA members last week in Greensboro, N.C., in what is the first-ever Customer Service Political Activist Program training. The goal of the pilot program is to help customer service members become activists who are armed with political education, leadership development, and action plans to build worker political power in North Carolina. The program will establish a statewide customer service committee in North Carolina focused on engaging customer service members in political, legislative, and organizing fights in the state. Nathalyn Bladen, a passenger service agent at American Airlines and a member of CWA Local 3642 said that as part of the training, which focused on the 40-year class war that's been waged against workers, "We began to realize the extent of how politicians have created our current problems. Once you know, you become responsible. And now we know. Now we have the responsibility to step up and drive change." The work is supported by CWA's Customer Service Growth Fund and Political Department Growth Fund. Twenty-three CWA customer service members last week gathered in Greensboro, N.C., for the first-ever Customer Service Political Activist Program training. AT&T CEO Randall Stephenson made a whopping $28 million in 2017 – more than 366 times the average rank-and-file AT&T worker. Verizon CEO Lowell McAdam made nearly $18 million, while American Airlines CEO Doug Parker raked in $12 million. Those numbers and more come from the AFL-CIO's Executive Paywatch website, a comprehensive searchable online database tracking CEO pay. The new paywatch report from the AFL-CIO shows that in 2017, CEOs of S&P 500 Index companies received, on average, $13.94 million in total compensation. Rank-and-file workers earned only $38,613, on average – a CEO-to-worker pay ratio of 361 to 1. Why does it matter? Big corporations have rigged the rules of our economy by passing the Republican corporate tax cut bill that rewards companies for offshoring jobs and slashes the corporate tax rate from 35% to 21%. Rather than aggressive stock buybacks to artificially prop up stock prices and raise CEO pay, companies must use these record profits to invest in their employees, who have seen their wages stagnate and their employers sending jobs overseas and to low wage contractors. This week, the U.S. House passed a bill to roll back protections that were put in place to prevent another financial crisis. The bill, known as the "Bank Lobbyist Act," is the latest in a string of rewards for the banking industry delivered by this Congress. To make matters worse, Republicans blocked the inclusion of an amendment from Rep. Mark Pocan (D-Wis.) that would have helped rein in the growing trend of big banks offshoring American jobs – a trend that is set to be accelerated by the Republican corporate tax cut bill. CWA recently released a report detailing numerous examples of how major banks have been laying off American workers while ramping up operations overseas in low-wage countries. Despite the massive windfall the banking industry is set to gain from the tax bill, there is no movement from the big banks to return jobs from overseas. In fact, the tax bill actually encourages the additional offshoring of American jobs. Rep. Pocan's amendment would have made financial institutions that have outsourced more than 50 jobs in a year ineligible for some of the deregulatory provisions in the new legislation and subject to stricter federal oversight. A similar amendment proposed by Senator Elizabeth Warren (D-Mass.) during debate of the bill in the Senate was blocked by Republicans. House Republicans also blocked an amendment offered by Rep. Keith Ellison (D-Minn.) that would have prevented deregulation of big banks that use predatory sales goals and quotas like those that drove the Wells Fargo fake account scandal. "Republicans have once again given Wall Street and major banks a blank check to continue their exploitation of American workers and consumers," said CWA Legislative Director Shane Larson. CWA has been fighting for years to build a democracy where everyone participates, every vote is counted, voting rights are fully enforced, and everyone's voice is heard. Our government, our workplaces, our political process, and our democracy have been rigged in favor of the top one percent. Every issue that CWA members fight for – from bargaining rights to retirement security, health care, and keeping good jobs in the U.S. – is affected by this rigged system. That's why fighting for Democracy is a core issue for CWAers. Now, CWA is supporting an exciting new initiative that Congressional Democrats rolled out on Monday, the Better Deal for Our Democracy. The plan focuses on strengthening and expanding voting rights, fixing our ethics laws, and rebalancing power for people by ending the surge of unaccountable "dark money" unleashed by Citizens United. "It is time for a new vision for our democracy, one that puts a priority on the participation of working people instead of on giving outsized attention to the views CEOs and Wall Street executives," CWA said. "If we enact the reforms in the Better Deal for our Democracy, we will reduce the power of big money in politics and increase voter participation. Our country will be stronger as a result."